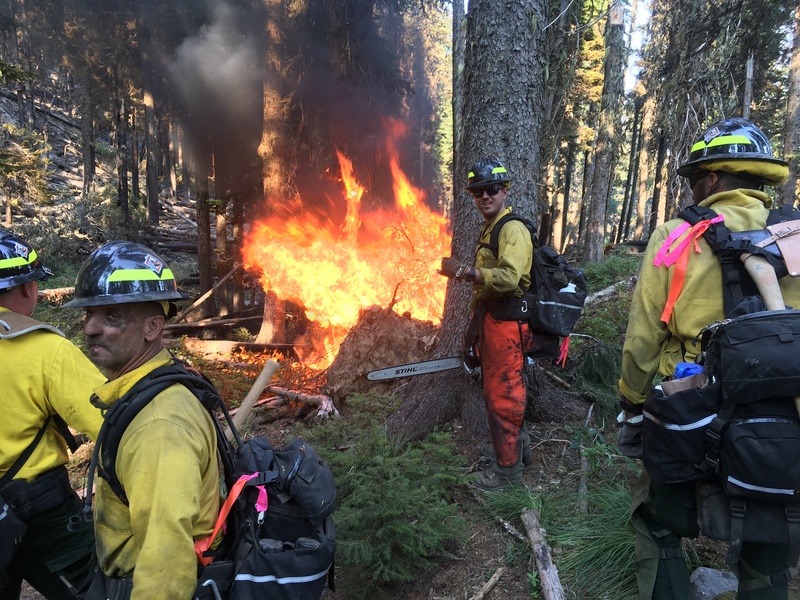 Delaware’s crew tackles a flare-up on Division Tango of the 180-acre Copper Mountain Fire in northern Idaho near the Canadian border. Twenty wildland firefighters from Delaware are part of 137 personnel battling the Copper Mountain Fire, a 180-acre blaze located four miles east of Eastport, Idaho on the Canadian border. Michael A. Valenti of Dover, Delaware’s state forester and crew boss for the team, reports that “firefighters are working in rough terrain and completing very long hikes to and from the fire each day.” The crew is staying in the relatively primitive conditions of a spike camp near the incident and eating MRE’s (Meals Ready-to-Eat). A “spike camp” is a remote camp near a fireline that lacks the logistical support of a larger fire camp, such as catered meals and hot showers. 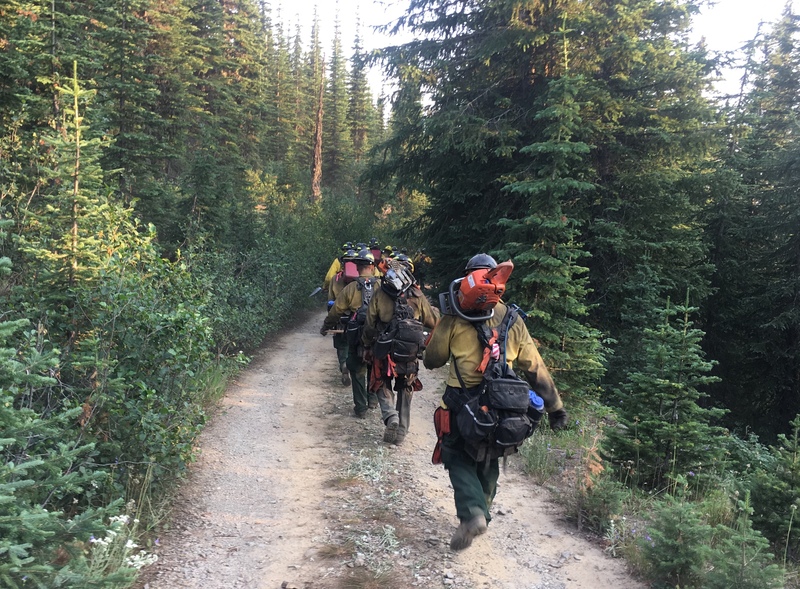 Delaware’s crew hikes back to its spike camp after a long day on the line at the Copper Mountain Fire in northern Idaho on the Canadian border. The 180-acre blaze was started by lightning on August 2. The Copper Mountain Fire is a lightning-caused blaze burning in timber that started on August 2. The fire is only 20% contained as of August 13 and is being managed by a Type 3 incident management team led by Rod Weeks. Firefighters are continuing line construction on both flanks of the fire and attempting to hold existing line. Fire officials are also coordinating with the British Columbia Wildfire Service on suppression efforts. For more information on the Delaware wildfire crew, contact Kyle Hoyd, kyle.hoyd@delaware.gov, 302-698-4548.